Match starts one hour earlier than usual. Another 50/60 runs , he will be certain to receive MoS. Dhoni stats nothing when playing like 51(96) .I will take 45(40) any day .only impact player in this team is Sharma Dhavan ,VK or may be DK . Mos goes to between marsh & Sharma ( whoever make more run in final odi ) or VK if he play like yesterday..Dhoni don't even have 1% chance . One inning doesn't hide his previous failures . dhoni is good in farming the strike .. so when dhoni scores , he makes sure that other batsmen can also score .. If he played like 88(96) .India would have won but instead of single double he was tuk tuk mode ,not even try for boundrys.its bloody 2019 not 2010 & world cup is just 3 months away . Virat came so many times when score like that but always maintained 85+ strike rate and nowadays strike rate around 50 is nothing less than criminal . It's easy to understand just remove CSK mafia eye from you . Why give one example .one inning doesn't hide his previous series of failures..
Thala job is to finish the game for India to have any chance for victory...And he is performing his job well since 2015 baaring few hiccups like yday. Actually kohli and Karthik ensured that thala doesn't screw the game. Had thala been screwed yday it was ram nam Satya for him from playing 11. So ya he has saved himself for further screwing India till WC. Can anybody tell me why Chahal is not playing? people have forgotten why we dumped Ashwin and Jaddu from the ODI team,they were not taking enough wickets and were hemorrhaging runs too.Chahal might be expensive but he had Kuldeep take a lot of wickets together. Coz you can't play three spinners in Aus..
With Pandya out, Jadeja plays at 7.. So you can play one additional specialist spin bowler.. Kuldeep has been preferred over Chahal because of the number of left handed bats in the Aus line up and that Chahal and Jadeja's stock deliveries spin in the same direction. When Pandya is back, they might play both Chahal and Kuldeep.. But with Jadeja in the XI, they can't play all three spinners. got up early and have plenty of time to spend .. I think Ind will go with same side. Hoping to see RayUdu flop again, so that we might see Gill playing in NZ. Lyon will make way for Zampa who won them a T20. dhawan , kohli and rohit wont have any issue with stanlake ..
Rayudu should be given one last chance to perform. As the performances in these matches is race for those players who wants chance to in Indian team for ICC World Cup 2019. If Dk had not scored 25 off 14...v would all be scolding msd big time as reason for loss. Rayudu should be dropped. Play thala at 4 , DK at 5 , Jadav at 6, drop Umesh Yadav 2.0 , bring in Shankar ji and see what he's improved on since that "close to match winning" knock for Bangalis . This is the side that will beat Australia and win the series. Can chase down any total and has the weapons to defend a decent par total. Bats deep to no.9 and has 6 bowling options. India have lost each of their last three ODIs at the MCG against Australia. Overall, India have lost nine of their 14 ODIs at this venue against the hosts. Their last win was in the CB series in 2008, when they won by five wickets, chasing 160. 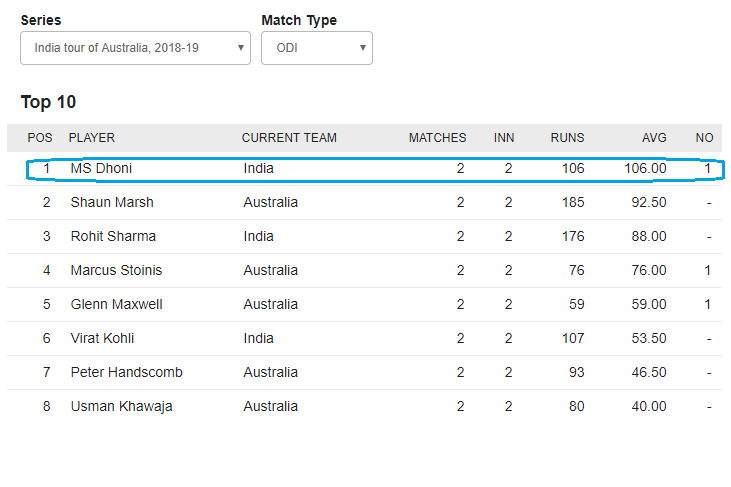 Kuldeep Yadav's strike rate drops to a wicket every 65 balls in final games of bilateral ODI series, a far cry from his career strike rate of roughly 26 balls per wicket. This is an indication that batsmen tend to work him out as a series nears completion. I would consider Chalal for Kuldeep. Australia would have to be cautious against the right arm spinner seeing they havent played him in a long time. India need to treat this like a world cup final. they should also make changes. If in a final they have to make forced changes then they know how they will respond. Plenty of games left for them to get into a rhythm.